15% of the total amount will be charged on the day of the booking if you book 3 rooms or more. This pre payment will be paid back if you cancel your reservation minimum 2 weeks before your arrival. Stockholm Hostel is probably the most modern and tailored hostel in Sweden with a private bathroom in every room. 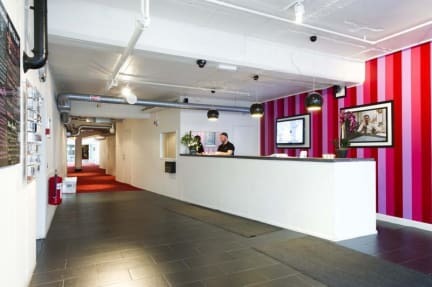 We strive to deliver the best hostel experience in Stockholm and give you most value for money. We have 33 rooms. Everyone features flat screen television, internet access, comfortable bunkbeds/single beds and a unique design bathroom. The rooms range from 2 beds to 6 beds/room. We got big beautiful social areas in the centre of the hostel for people to meet each other. A big spacious kitchen for cooking any type of food. The location is just perfect. Restaurants and bars around the corner as well as busses and subways. Shopping centre 100 meters away..
Amazing hostel, one of the best I've stayed. This is a really great place to stay. It's quiet, clean and the staff is super friendly. Highly recommended! Very nice hostel. 4 bed private room was small, but satisfied our needs. The hostel offers free linens and towels. I would definitely stay again. Had a lovely stay here. 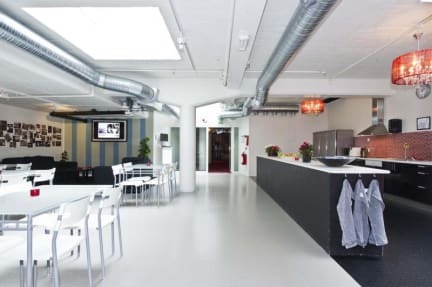 The place is in a vibrant part of town, with good transport links to the city centre in the shape of Fridhemsplan metro station, which is a five minute walk from the hostel. The room was very clean, and as we'd booked a private twin room, we even had a nice ensuite bathroom to ourselves, all for a very reasonable price. The staff were also really friendly and happy to help by giving directions/recommending places to visit! Hostel is a nice place for a short stay. It is clean and you get towels and linen for free. Everything is great except the temperature in the room. it was too cold. The location of hotel was good - supermarket is near there, and subway station and bus stops are near - and clean! But there was no staff as I arrived at 10am - I planned to hang out after leaving my luggage - therefore I should've waited in cafe for an hour and I could go in (by one person coming out from hostel). Without this, overally it was very good and I would like to stay again. Very friendly and helpful staff but unfortunately no windows in the room. The Hostel was clean and cozy, with a nice little bathroom. One major issue though: There were windows leading out to the street with no curtains! So that means you could never darken the room when you were sleeping. I hope they'll change this soon.